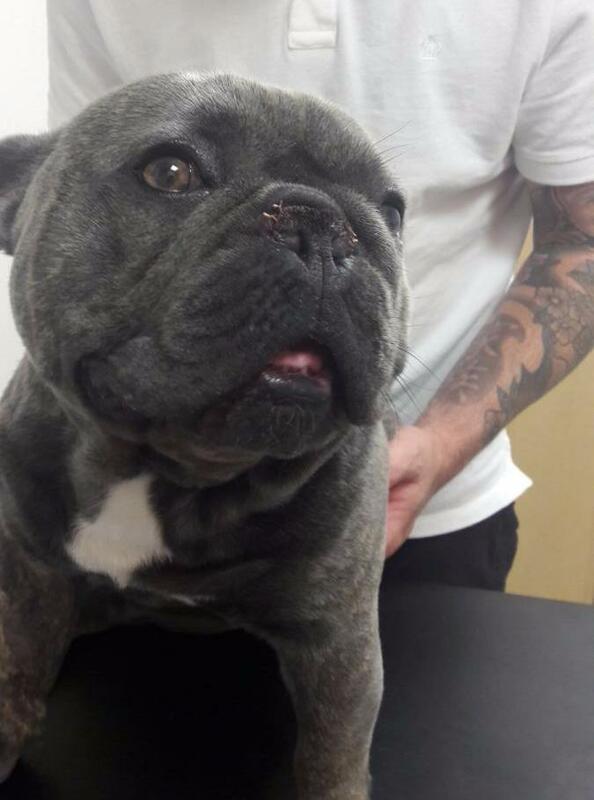 Rocco is a 1 ½ year old French Bulldog who came to the clinic recently to see vet Amber. His owners Josh & Laura were concerned about his breathing, as he occasionally seemed to struggle. Amber diagnosed Rocco with something called “Brachycephalic Obstructive Airway Syndrome” (BOAS), a common condition in Frenchie’s and breeds with squashed noses. The condition means that the soft palate (at the back of the mouth) is too long and gets in the way, making it hard for dogs with this condition to breathe normally. Rocco was referred in-house to Catherine Sturgeon, a specialist in soft tissue surgery. Catherine came to the practice here in Liverpool and was able to assess Rocco and perform the surgery here on the same day. He had his soft palate shortened and his nostrils widened to enable him to breathe more easily. We saw Rocco again a few days ago and he’s doing great – his owners have already noticed the difference in his breathing and he has recovered really well!